Whether you have something to celebrate or just want an excuse to party with your friends, our thriving live music venues are the perfect place for your group. 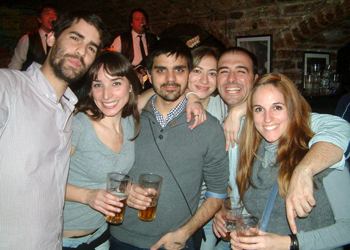 Both the Cavern Club and Cavern Pub are open 7 days a week and cater for all types of groups of all ages. Groups of 10 or more should be booked in advance, please email [email protected] or tel: 0151 703 9100 for more details. For general admission to the Cavern Club after 8pm Thursday, Friday and Saturday you can check ticket* prices and buy online here at a discounted rate. Admission to the Cavern Pub is free. *Please note that large parties will be admitted to the venue at the discretion of the door staff. At busy times we cannot guarantee entry. Group tickets on the Magical Mystery Tour can be booked on line. Group discounts for 10+ people apply*. To book seats for your group on the Magical Mystery Tour click here. *Please note that online ticket sales are limited to a maximum of 25 per transaction.